Oflate, I am getting frequent requests for bit error rate simulations using OFDM (Orthogonal Frequency Division Multiplexing) modulation. In this post, we will discuss a simple OFDM transmitter and receiver, find the relation between Eb/No (Bit to Noise ratio) and Es/No (Signal to Noise ratio) and compute the bit error rate with BPSK. Let us use the OFDM system loosely based on IEEE 802.11a specifications. You may refer to post Understanding an OFDM Transmission for getting a better understanding of the above mentioned parameters. In an OFDM transmission, we know that the transmission of cyclic prefix does not carry ‘extra’ information in Additive White Gaussian Noise channel. The signal energy is spread over time whereas the bit energy is spread over the time i.e. In OFDM transmission, all the available subcarriers from the DFT is not used for data transmission. Typically some subcarriers at the edge are left unused to ensure spectrum roll off. For the example scenario, out of the available bandwidth from -10MHz to +10MHz, only subcarriers from -8.1250MHz (-26/64*20MHz) to +8.1250MHz (+26/64*20MHz) are used. This means that the signal energy is spread over a bandwidth of 16.250MHz, whereas noise is spread over bandwidth of 20MHz (-10MHz to +10MHz), i.e. Can observe that the simulated bit error rate is in good agreement with the theoretical bit error rate for BPSK modulation i.e. Can u explain why u have used ifft(fftshift) as well as fftshift(fft)? why not simple ifft and fft? @Nag: fftshift is used to take the samples from [0:31, 32:63] and replace it as [-32:-1, 0:31]. The post on -ve frequency will be of help. I want to know what is the effect of different modulation techniques like BPSK,QPSK, 16-QAM,64-QAM on OFDM bit error rate for constant SNR 15db? @Neetu: For a given SNR, the highest order modulation (i.e. 64QAM in your list) will have the highest probability of bit errors. I am working on OFDM throughput calculation for 16,64-QAM. I am using 512 FFT and 360 data carriers, channel bandwidth of 5Mhz. How do i get the number of bits per sub carrier? @Preethi: For 16QAM we have 4 bits per subcarrier and 64QAM has 6 bits per subcarrier. Btw, are you loading all subcarriers with the same constellation type ? Can you plz provide the simulink model for parallel concatenated turbo decoder? do u have coded OFDM using Reed Solomon codes over Rayleigh fading channel. im doing my project in this. i have done upto ifft and dont know whether it is correct or not. it showing some error. c = rsenc(msgw,n,k); % Encode the data. X Must be a vector. sir,kindly plz check my initial code. hopefully waiting for ur reply. @vyga: is it giving error when noise is forced to zeros? % Compute bit error rate from simulation. sir,kindly plz check my code. hopefully waiting for ur reply. sir first of all thanks for your code…. please tell me meaning following commands .why is nSym*80 done ? @Manish Kumar: In the simulation we are assuming 64 samples form and fft symbol, and 16 samples are appended as cyclic prefix – adding upto 80 samples per symbol. I want to simulate a bandwidth efficient OFDM scheme and want to compare its bandwidth efficiency with existing scheme. How to evaluate or compare any two mudulation/communication schemes for bandwidth efficiency? I mean what sort of graphs or tables do I have to plot/tabulate? @kiran: capacity in bits/per seconds/per Hz is a good metric for comparing the modulation schemes. For eg, wireless LAN 802.11ag standard uses BPSK for providing the lowest 6Mbps data rate and 64QAM for the 54Mbps data rate. I am doing thesis in MIMO OFDM. I need a code for MIMO OFDM BER v/s SNR in MATLAB. Modulation can be bpsk,16 qam, qpsk or any other. 2 transmitting antenna, 2 rx antenna. I will be very obliged. d) channel estimate and so on. EVM is a good metric to be used for evaluation. @nirav: I have to discuss ReedSolomon code. Will add to the TODO’s. Sorry, due to time pressure I wont be able to help you with the matlab code part. However please refer some of the posts in http://www.dsplog.com/tag/ofdm for your reference. Can you please suggest me how to start with matlab coding..
evn i dnt kno hw to start wth it..i have studid matlab help and books regarding this but actuly nt getting wat to do next..m starting my thesis work on this bt nt getting how to start…with MIMO OFDM equalizer for spatial multiplexing ..means shall i hav coaching for it? @Meenakshi: Matlab is a relatively easy language to learn. Thank you for good instruction of OFDM. Could you tell me what is correct? in real situation, do we normalize it to make transmitted power 1? or you just normalized to show same BER performance.. Thank you for your nice reply in advance. @Ryan: The changes in normalization will shift the curve to the right or left (but does not change the slope). For this simulation, I wanted the ofdm BER to overlap with the EB/N0 vs BER plots – hence did the normalizations to reach the same Eb/N0 using OFDM too. Am writing another post with comparing Eb/N0, Es/N0, SNR etc. Will update soon. in ofdm (FFT) , when i want to remove the guard interval (zeros) , then nDSC=nFFT,, i need to normalize the ifft operation too ??? @osama: For removing the guard interval, believe you wanted to remove the cyclic prefix (and not the null subcarriers)? in other word, i want to use 64 subcarrier for data and 16 subcarrier as cyclci prefix ? i am know that, but it is represent an extra overhead. with CP we repeat transmission part of data so we need extra bandwidth (i.e, the CP reserved 16 subcarrier). sir iam doing work in adaptive overlap and add technique in mb ofdm….so please solution the matlab code……………..
ipModHat = 2*floor(real(yMod/2)) + 1; ? Why does it have to be applied before veryfing if the real part of the received symbol is positive or negative? @Raul: This is one way of quantizing the received signal to +ve and -ve. one more question: I think if we use other types of modulation(16-qam,qpsk,etc) , then on the condition of AWGN channel, the BER-EbN0 will be the same no matter whether we adopt the OFDM technique. ~~~ is that right? then we do obtain that the simulation results are the same as the theory ber?? Thank you very much ,I do get the same results! I am so happy now. I owe all to your helpful website,Thank again! On the topic of the effect of oversampling,you can have a look at the help doc of matlab,there is a explanation. Or you can refer to my blog ,I paste the ‘explanation’ on that. since I am from Chinese,you can ignore those words,just have a look at the last picture. @Michael: Glad to help. Thanks. thank you very much for your very helpful website.I have learn a lot about OFDM via your website. I have a question today, that is,in your code,when you add noise you account for the effect of CP ,if we don’t consider this then results will be a little different with the thereotical curve. I’m so glad to have your relay so soon,recently,I also do some investigation on this issue .You have just mention about the SNR. From my point of view,I think SNR and Es/N0 will be the same in almost cases,but for the oversampling. is that right? @Michael: Mmm… for the oversampling affecting the SNR, can you point to a specific example? i am doing work in OFDM & CDMA . i required solution matlab code of PAPR of OFDM by SLM and PTS for diffrent value of N subsymbols . hi!!!!!!!!! me too working on the same for my PG work!!!!!!!!!!! if we tried together we can able to do it! thank you very much for your very helpful website. I’m now doing analyzing the sampling offset in OFDM. but now i even cannot get a correct graph after adding the noise! can you tell me what’s wrong with my programme? @Katy: I din’t understand your code. How are you trying to model sampling clock offset? I am doing a project on ofdma dynamic bandwidth allocation schemes.As I am new to matlab, can you send me the basic MATLAB codes for simulation of mac layer protocols.It will be very helpful if you have the present GPON dba matlab codes for maclayer for different traffic loads. I have a question: I didn’t understand how to model different fading for each OFDM symbol? So what is the term to add to this line to get different Flat fading for each OFDM symbol? have discussed a 10 tap channel, with the channel taps randomly selected for each symbol. @vasanth: For achieving the same BER, 16QAM requires higher Eb/N0 than QPSK. what does the sign .’ mean ?? I was wonder if you are going to post anything related to Basic LTE transmission which might be similar to this post. Hi, Krishna Sankar, thank you for this wonderful post, but, when I come to my project which is based on the OFDM system, I need to use pilots to estimate the channel, and according to the IEEE802.11a and your statement, we would allocate 4 pilot subcarriers at -21, -7, 7, and 21, and the data is allocated from -26 to 26, so, my question is that how can we estimate the channel for the data from -26 to -21 and from -7 to 0(DC, and from your source code, this DC would be removed) by linear interpolation? @Xudong Wu: Well, in 802.11a we have a preamble portion defined as “Long Training Field” at the beginning of the packet. All the subcarriers in this preamble is known at the receiver, and this is used to estimate the channel. As the packet duration is in the order of 100′s of us, the channel can be assumed to be constant for the duration of the packet. The pilots are used to correct for residual frequency errors, sampling clock offset etc. 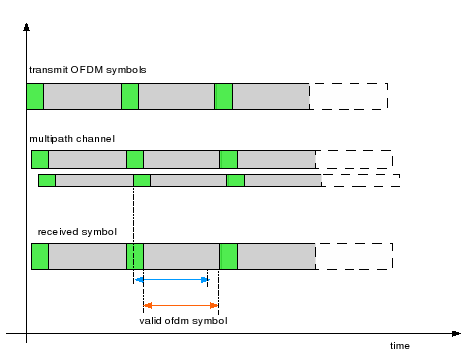 Thank you for your explaination, so, can you make a post to illustrate channel estimation in OFDM system? @Xudong Wu: Ok, will do so. Hey krishna. I have certain questions to ask…. 1. Why the length of the CP is taken exactly 16 samples. do I need to add some scalling factors to get accurate result…as when I am following your simulation then in case of 16Qam without cyclic prefix the result is comming out to be correct…but with cyclic prefix the curve just deviates…..
1. Why there is a need of normalization? 2. Before ifft, you have taken fftshift that swaps the data elements, why there is need of fftshift? 3. how this line counts error nErr(ii) = size(find(ipBitHat – ipBit),2);? Please elaborate. 1) The normalization is to make the transmit power unity – to allow for precise definition of Es/N0. 3) The find() looks for differences between the two variables. The size() counts the number of differences. @eng_dina: Good luck with you are algorithm investigation. Hope you have made the simulations and obtained satisfactory results. @eng_dina: How are you modeling the CFO for MIMO systems? If all the chains have a common RF clock, then all the chains will have similar CFO and the estimate from all the chains can be combined to improve the accuracy of the CFO estimation. If the chains have independent RF clock, then we need to estimate CFO on each chain independently. Hi, could u please post a new subject to describe the SER and BER for MQAM(M>=4) in OFDM? I’m confused about the Es here, does it mean the sample energy in time domain or the energy in frequency domain in used data sub-carriers? And, why do you use the same theory BER formula for BPSK in an un-coded awgn? how can I get SER from BER(vice versa) in OFDM? Why the normalization factor in the ifft is (nFFT/sqrt(nDSC)) instead of sqrt(nFFT/nDSC), just like sqrt(80/64) when considering cp? why to multiply sqrt(nDSC)/nFFT ? In order to normalize again? But when you normalize the transmitted signal , you just add awgn, nothing else affect it . Why to multiply the factor? P.S: Thank you for your Matlab code, it helps me a lot with my thesis. Your simulation is a great help to me, and I can well understand it. However, there is one question confusing me: Although the simulation result showed the same performance between BPSK in AWGN and BPSK over OFDM in AWGN, could you please give me a deeper explanation? As far as I know, FFT(n) don’t have the same statistic property as n. So we can’t get the same result as BPSK in AWGN. Is this correct? @Zhongliang: Well, I think fft(n) has the same statistical property as n, and hence we get the same result. Unfortunately, am unable to point you to some text books which describes the proof for above. If you stumble across something, please let me know. 54 Mbps) under AWGN channel. @waleed: Sorry, I am not familiar with the topic which you are referring to. @kim: What are metrics on which you wish to compare? @kim: This post should serve as a basic starting step. Ofcourse, in 802.11a/g OFDM chain, there are other stuff like scrambler, coding, interleaving, filters etc…. for CDMA in rappaport’s book , He has explained from the block diagram till the derivation of probability of error.With Gaussain approximations too. Could you suggests me one or where have you reffered for the derivation of the same kind and deeper explanation. Thanks very much, your guidance, your work and your advice is really getting me through in my dissertation work.You are indeed a supervisor for this my project, and i will not finish this work workout puting ur name in the ACKNOWLDGEMENT section of this project. More grace to your ego. Actually i have used your answer below to try and achieve a different noise (SNR), that is to get different graph for different SNR, but i was unable to do that. WHEN I USE SNR=[0:10], THE FIRST GRAPH WAS PLOTTED, BUT WHEN I USE SNR=[0:20], AND [0:30] THE GRAPH STILL REMAIN AT SNR=[0:10] .i believe that something is still missing, pls i will need your help, so that i can provide solution to this. Secondly, i want to use SIMULINK, a real life model of mobile to base station link and work out BER for various noise conditions, pls i will appreciation if you provide guidance on this for me OR probably a solution. While looking at your code, I find that you are adding CP before converting the parallel stream in to serial. So it means there is a cyclic prefix for every parallel branch. I’m not too sure about this since I think CP should have been added at the very end, after the stream has been converted from parallel to serial. @communications_engineer: Well, the parallel to serial aspect is a ‘notional’ thing. Don’t you agree? We need to add cyclic prefix for every ofdm symbol (i.e for every ifft out). thnks for Your simulations which are very usefull. Does this script work correctly only if we know frequency response? graphic has still tipicall shape for Rayleigh channel. At receiver, we do Y/H = X + N/H. The term N/H can cause poorer BER. Makes sensE? but i can not understand why you multiply by sqrt(80/64) ? ?how this term normalize symbol power?? @ahmed: Since the cyclic prefix samples are ignored by the receiver, the noise added to those samples does not have any effect on demodulation. To account for that, the term sqrt(80/64) is used. 1-we assume that the cyclic prefix is of duration 16 samples and the data symbol is of duration 64 samples. The term sqrt(80/64) is to normalize the transmit power. can you explain by equation how this term make transmit power=1? 2-you said that we put 12 carriers (6+6)at the edges of band to prevent interference from other bands….in your simulation,you used ifftshift and put zeros in the middle.why??? @Egerue: Do not change the division factor. Rather change the value of Eb_N0_dB. The division by 20 is required to convert dB into voltage. @EGRUE: Yes, the term 10^(-EsN0dB(ii)/20) is to scale noise voltage differently. Hi, I didn’t get your line, can you please make it simpler? Hi Krishna, how are you doing ? what’s current topic you are work on? which is more logical way of representing (S-P & modulator) ? I think when no. of symbol=no. of bits(BPSK case), then it doesn’t matter the priority But for other modulation techniques like QPSK, MPSK , MQAM, (M> 2).. the method 2 should be followed. Am I right? Note that the grouping am performing here is to group into OFDM symbols. @christine: The variable xF represents the input to the iFFT. It represents subcarrier indices from [-32 to 31]. However as we are using only indices from [-26 to -1, 1 to 26], we have 6 zeros in the beginning, 26 used subcarriers, unused dc subcarrier which is not used, 26 used subcarriers, then again 5 zeros at the edge. Helps? I have a problem understanding the term ” number of used subcarrier=52″. I understood the significance of the guard interval (Tcp+Td=Ts). In your example does the the data symbols ( 3.2 µs) correspond to the 52 used subcarriers. And deos the Tcp correspond to 14 other sub-carriers? @Ismail: The data symbol duration of 3.2us corresponds to the fft size (64) and the sampling clock (20MHz). To send 64 samples at 20MHz, we need 3.2us. It does not correspond to the number of used subcarriers. the data rate = number of bits per symbol / symbol duration = 52 / (80/20) = 13Mbps. I use nSym = 10^4 to get statistically accurate results. in your script you added term 10^(-EsN0dB(ii)/20)*nt to xt as additive white gaussian noise. i want to know how actually the above term comes. how can i do same thing with awgn command in matlab. secondly i want to include RS channel coding in above script will you help me plz. @Bhasker: The term 10^(-EsN0dB(ii)/20) is to scale the noise voltage such that the ratio between signal energy and noise energy is scaled. I do not have matlab, hence unable to help with the arguments in awgn() in Matlab. I have not discussed RS codes in the posts till now. Hope to do so in future. i did that and thanks but i tried to do same thing you did for qpsk but it is not working. could you hel me. @amy: Sorry, due to time constraints, I find it difficult to debug the code. If you can mail more about “what is not working”, i can try to help. We can use this one. the above one was a function. which bag do you mean? @Amy: Hmm… why dont you use ifft to generate the frequency response of the channel? Also, typically we can convolve the time domain transmit sequence with the time domain channel. @Amy: What is the bug in the code? i want to know why have u added only 10 taps ? what is the logic behind it ? @hemdutt: In the simulations, I have a defined a cyclic prefix of duration 16 samples. I wanted to have a channel which is having shorter duration than the cyclic prefix. Hence I chose 10. Or EsN0 = EbN0*(nDSC/nFFT)*(64/80)*log2(M); but I couldn’t find it in any reference. Where there is an extra term (nDSC/nFFT) in your equation. Could you give me your reference please? @Sami: I do not have a reference for the term (nDSC/nFFT). However, the term is needed because we are using only nDSC subcarriers out of the nFFT subcarriers. When we define the variance of noise in time domain, the variance on each subcarrier is the same and affects the subcarriers which are not used also. However, the un-used subcarriers need not be factored in for Eb/N0 definition. Hence the usage of the term nDSC/nFFT. Hope this helps. Please revert for clarifications. The first term (nDC / nFFT) can be seen as a factor to get the effective SNR (Es/No) in the system which has fewer sub-carriers loaded than the noise bandwidth. So SNR per subcarriers is better by that factor. The second term (Ts/(Ts+Tcp)) is a result of the usual Es/No = Eb/No * (R/B) for any system. I hope this clears the confusion. Power normalization means that the power of the signal should equal one after normalization. the power do not equal one. Could you explain what going on, pls? @Sami: The power of x1 is indeed one. Why did you multiply by sqrt(80/64)? -For x1, the power will be one only if we make the value of nSym very large, but for small values of nSym the power does not normalized. So I think its better to generate the noise first, then calculate the generated noise power, after that normalize the generated noise power. In this case the noise power will be 100% normalized, and it will be independent on the value of nSym. -For x2, I read your reply for Jimmy that you multiply by sqrt(80/64) for normalization purpose. @jimmy: In the simulation model, we assume that the cyclic prefix is of duration 16 samples and the data symbol is of duration 64 samples. The term sqrt(80/64) is to normalize the transmit power. This normalization ensures that scaling of noise with respect to Es/No is valid. 2/ The reply to Jimmy was about normalizing the transmit signal (and not the noise signal, which you are referring to). Jimmy’s query about sqrt(80/64) is pertaining to the transmit OFDM symbol where only 64 samples are useful (the rest 16 are redundant). 1- I want to use Wimax frequency selective and flat fading channels, how can I create such a channels in your program? or the frequency selective channel you have created (random complex numbers) is also valid for Wimax and if I put nTap =1 would i be flat fading channel? I know there is also a built in function in MATLAB for such channels but I am unable to simulate using them. 2- As I increase the number of Tx antennas e.g. 2nd antenna, do I have to create a new set of parameters for it? e.g. separate channel, frequency response and noise for this 2nd signal. If its true; then How will I equalize 2 different signals after FFT as I would have already combined these two signals right after the Rx antenna (so now there is only 1 signal again). One of my idea is to calculate separate frequency response for each channel and then add them to form a combined freq. response and then equalize using this single freq. response. Am I right! or whats your suggestion? I would really appreciate your prompt help. If you put nTap=1, then the channel is flat fading. 2/ You can write down the equations for 2-transmit 1-receive antenna case. Since you might be knowing the channel for each subcarrier, you can divide by the channel to equalize the received symbol. Hopefully the post on Transmit Beamforming might be of help. i am ding project on pulse shaping design for ofdm ….i am writing but not getting properly can u give any code for that …sothat i can go further plz ..
@chanti: In typical OFDM systems, as we are using sinusoidal pulse shapes (thanks to ifft), we typically do not need to do any ‘extra’ pulse shaping. I want to extend the simulation to a general mQAM constellation and if I understand how this expression is derived, probably I can write an expression similar for example for 16QAM or 64QAM. 1/ The term Es = (Td/(Td+Tcp))Eb comes because, we are sending samples over the time (Td+Tcp). However, useful information is contained only in the time Td. 2/ The term Es = (nDSC/nFFT)Eb comes because, we sending nFFT subcarriers. However, we are sending data only on nDSC subcarriers. 3/ Well, for a higher order modulation like M-QAM, one might also want to factor in that each symbol carrier log2(M) bits. For example, Es’/N0 = kEb/N0, where k = 4. Thanks for your kind answer and clarifications. Combining (??how??) the above two aspects [Es = (Td/(Td+Tcp))Eb] and [Es=(nDSC/nFFT)Eb], the relation between symbol energy and the bit energy is as follows:Es/N0 = Eb/No (nDSC/nFFT)(Td/(Td+Tcp)). Looking in this list of comment, I’m not the first that ask you the same question (see lk n.44). Also useful could be a reference where to find how this relation is derived. I have nothing to say but you are doing very good work. 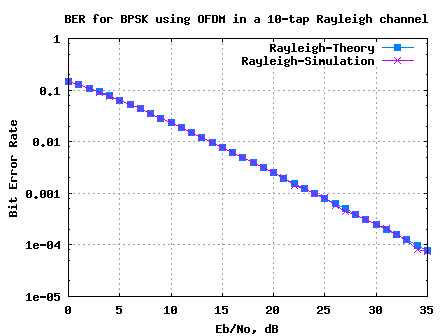 I wrote my own code for BPSK-OFDM and it worked fine in AWGN channel, but when I involve the rayleigh channel (even the static single path one) my results of BER stays around 0.5. my thoughts are that I have some problem in the channel modelling as I am using the built-in matlab to build it. I will very much be grateful if you can email me to send you my code to have a look at and might suggest a better channel modelling. @santro: The result of 10*log10(64/80) and 10*log10(3.2/4) are the same, no? I just used the other one, because I assume that the sampling frequency is 20MHz, hence 3.2us = 64 samples and 4us = 80 samples. If I wanted to extend your equation for Es/No = f(Eb/No) to an OFDM system with QPSK inputs, how would I do that? I’m trying to build a Matlab script that computes the BER for OFDM using QPSK but I can’t get the correct noise variance. Thanks krishna, this is indeed a great help to understand signal processing issues in OFDM, but I still do not understand why we need to normalize when using the FFT/IFFT or adding a term to compensate for the wasted power in CP. I really appreciate your help. @Saria: We add all those normalizations to ensure that we define the correct Eb/N0 when obtaining the BER curves. SO, it is not something applied in the practical signal transmission using the standard of the IEEE 802.11? Also, in general for any modulation or multiple access scheme, when do I need to normalize and how do I determine the value of normalization factor. Really, many thanks. 64-QAM – 1/sqrt(42) and so on. Krishna, do u have script for QPSK BER with OFDM modulation? i’m working hard on a project about PLC – Powerline Communications, and i need to simulate a channel PLC with OFDM, and it can be with QAM or PSK. Do you have something like that? Congratulations about this site, it’s helping a lot to many students around the world. Thank you. @Atif: One approach is to remove the effect of frequency offset in time domain. t – is the time. f’_d – is the estimate of frequency offset. I think the code by Krishna is available for ofdm. and you can take help from the code. its really very helping things from Krishna. @invizible: I just the instructions over to you on email. hi, thankyou very much for previous responses… i hope you are doing fine … i saw your above code for ofdm transmission and i made some changes i.e. doubled the cyclic prefix and then plotted the curves … but the performence was exactly the same… shouldnt it get better with increase in cyclic prefix i mean in terms of error improvement? @invizible: Hmm… the increase in cyclic prefix wont bring you better performance in AWGN case. As you are aware, cyclic prefix does not carry any extra information. It justs serves as a buffer to prevent interference from the previous symbol in a multipath channel. So, your observation that there is no improvement with extra cyclic prefix in AWGN is correct. sorry i forgot to mension the nt term noise will be produced as usual with randn it is not zero. (1) So, are you getting zero error rate, if you force the noise term nt to 0? (2) The term (nFFT/sqrt(nDSC)) is for normalizing the transmit power to unity. and i will run the programme for a number of times,but the attn. is not changing and getting almost a constant Ber graph. @mohammed: Well, if you make the noise term (nt) to zero, are you getting zero bit error? i am very new to ofdm, i have to simulate the ofdm with adding noise and etc..
hi…do you have qpsk ber with ofdm modulation matlab coding with some explaination??? if you do could u post the url?? @keroppi: Sorry, I have not posted on BER with QPSK with OFDM. actually i have to make OFDM bandwidth efficient…for this purpose when i completely removed cyclic prefix(guard interval) i saw that number of bit errors increases and probabilty of error increases as well…and this is logical….but thats not the case with 54Mbps datarate…For 54Mbps when i removed the guard interval it starts showing less bit errors and data rate became improved….why happened openly for 54Mbps…Plzzzzzzz help me out why this is happening???? @zain: Well, no. In AWGN, the absence of cyclic prefix should not cause bit errors to increase (need to ensure that Es/No and Eb/N0 are scaled appropriately). - Could u pls explain how did u connected the two formulas to become the EsNo = EbN0*(nDSC/nFFT)*(Td/(Td+Tcp)) ? Did u use the EbNo = (S/N)x(B/R) ? (S/N – SNR, B-Bandwidth, R-Bitrate). Thank u in advance ! @Ik: The relation Eb/No = (S/N)*(B/R), is mostly tuned for single carrier systems. The underlying concept is still the same, however for OFDM, we need to consider some of the additional parameters like cylic prefix, number of used subcarriers etc. Hope the explanation provided in the post helps. Thanks for response. But i don’t quite get it. If u write Es = A*Ey, and Es = B*Ey then mathematically A = B. You can not just multiply those values and write Es = A*B*Ey, don’t you think ? Can you describe it mathematically how did u come to this farmula ? Thank you ! Did you find an answer to this question? we add four pilot carriers modulate nothing on them and we just terminate these four carriers at reciever side…so why to waste our bandwidth by using these pilots?? why we have to use pilots??? secondly can anyone tell that why we use 4 pilot carriers??? As you said, one way is to reduce the duration of the cyclic prefix. If I were you, I would not eliminate cyclic prefix completely, rather use a shorter value of cyclic prefix. For ex, in 802.11n specification there is short GI mode, where cyclic prefix duration is 0.4us (instead of the normal 0.8us). Another way to improve data rate is to use to reduce the number of guard subcarriers. Probable third way to improve data rate is to use MIMO. However that requires more than one transmit and receive antenna. I do not have Simulink with me. Hence wont be able to help you with bertool on simulink. I didnot understand how you got the final equation between Es/No and Eb/No. How you equate 20 MHz.Es = 16.25 MHz Eb?? I thing there should be equation number of easy reference. @sandeep: This is because, the signal bandwidth is on 20MHz, however the used data subcarriers is only 16.25MHz. Let’s say we want to implement channel coding to the system and the size of the coded bits is 60. Can we use 60 subcarriers instead of 52? The resulting effect: is it the transmitted signal will be more likely to be interfered by other signals? If the size of the coded bits is 104, can we divide it into 2 streams to append the cyclic prefix separately and later concatenate the 104 coded bits at the receiver? @jimmy: Yes, we can send on 60 subcarriers. For the unit level BER simulations the fact that we do not have sufficient gap between spectrum from adjacent channels does not matter. This matters only when we try to deploy the system and try to meet the spectral mask requirements as put up by 802.11a specification. If the coded bits is 104, we can use double the number of OFDM symbols to transmit the information. I hope you meant that when you said two streams? OR where you thinking of parallel transmission stream (aka MIMO)? @jimmy: If you see the simulation model, for defining the Eb/No I have considered the wastage due to cyclic prefix and unused subcarriers. That is why the Eb/No curves are matching. If we plot the Es/No curves we will see the difference (in a simple BPSK Eb/No = Es/No). In typical WLAN, there may be multiple transmissions happening on different frequency bands. Multiple frequency bands are separated by atleast 20MHz. If you notice, the null subcarriers are located at both edges of each band. The presence of null subcarriers on each band ensure that the energy in one band does not leak into the other band and vice versa. Hi, in the simulation result, the performance of both cases (with and without ofdm) is the same. For the case with ofdm, it uses 52 subcarriers. 12 subcarriers are unused and 16 subcarriers are for the cyclic prefix. The energy would be spread among both the used and unused carriers. Since there is wastage of energy, why does the performance of both cases (with and without ofdm) appear to be the same? For the WLAN, the fft size is 64 and the used subcarrier is 52. Isn’t it better to use a larger number of subcarriers instead of wasting it? Hi, may i know why do we need to multiply the transmitted signal by sqrt(80/64)? Yes, I think scaling of the noise by 1/sqrt(code_rate) to account for coding is correct. For eg, if coding rate is 1/2, the variance of noise is doubled as we require to send two coded bits for each data bit. Hi, how do we add in channel coding to the matlab code? Let’s say we want to use block codes. Can we use any size for n and k? @jimmy: Well, it depends on the type of block code which you want to simulate. In this OFDM example, if the number of bits after coding is not coming as an integer multiple of number of bits per symbol, we can add extra zeros (which maybe ignored at the receiver). For the multipath channel which has tapped delay line coefficients h=[a b c], when you say making the variance of the multipath channel to unity, do you mean that |a|^2+|b|^2+|c|^2=1? @roisin: Yes, normalize the average channel power over multiple channel realizations to 1. (a) Yes, it should include the alphabet size. I did not include in the above equation as we were discussing BPSK case. (b) It depends on the variance of the multipath channel. Typically, we can try to make the variance of the multipath channel to unity. Then there is no need to modify the variance in the noise term. Also, should there be any modifications to the addition of noise if our transmitted signal passed through a frequency selective channel? For example if our channel has tapped delay line profile (like a SUI channel) h=[1 0.3162 0.1], then the recieved signal is conv(s, h)+noise, where s is the OFDM symbol with cyclic prefix. The convolution will yield a signal with length=(fftsize+cyclic_prefix_size+length(h)-1). The noise to be added must also be a vector of this size, but what modifications must be made to the variance No, or the SNR expression? @mohammed: It depends on the system which we have – some specifications like 802.11a has coding/interleaving etc. In the simplest case, we can directly apply the data to the defined data subcarriers in the ifft. That is the approach which we used in the Matlab/Octave simulation model provided in this post. @MUTHUKRISHNAN: I do not think that the following statement – “You have written the code assuming that the bits are coming at the rate of 20Mbps.” is true. The key to control visualize the spectrum is on the assumption of sampling frequency of the fft. If the fft is operating at a frequency fs, then the symbol duration in the above system is 80/fs. The data rate is 52/(80/fs). If fs is assumed to be 20MHz, then the data rate is 13Mbps, Do you agree? You can use pwelch() command to plot the spectrum of an OFDM packet consisting of multiple OFDM symbols. The Matlab/Octave script in the following URI might be helpful. i am trying to simulate ofdm with bpsk.i was able to get the +1 -1 signs.what do i need to do before applying this out put to IFFT. I saw your code for OFDM transmitter. You have written the code assuming that the bits are coming at the rate of 20Mbps. Is there a way to write a MATLAB script that will simulate a random bit generator at 20MHz using RAND function or should we only go to simulink for that? 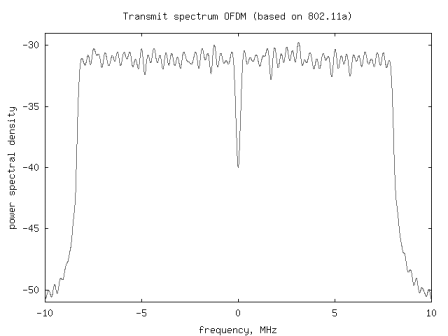 I would like to see the spectrum of the OFDM symbols for an random input of 20MHZ. though we can plot the spectrum by taking the x-axis as Fs*(-N/2:1:N/2)/N, it would only be to visulaise the plot. Can you give me a hint on that? @victor: Yes, it can be. However, I do expect coding/debugging to be take more time in C++. thank’s…can it made using another methode?except matlab.haw about C++. @Moayid: Thanks for the comment. However, may I suggest I would prefer to help you debug (than debugging the code myself). (b) before moving to bit error rate, maybe its simpler to find symbol error rate. (c) Once you get the symbol error rate curve correct, then one may move to bit error rate. The following posts on 16QAM maybe helpful. @Hussien: Typically for channel estimation, we send a known sequence (called preamble). Using the knowledge of the known sequence and what we received, we can estimate the channel. One more thing: I’m looking for MATLAB code for channel estimation and synchronization for OFDM system. @Hussein: Thanks. I do not have the codes, but I would think that it will be reasonable to extend the available simulation models to 16QAM case. thank you very much for Your simulation and theory prgram, really they are very useful. Do you have the matlab code for OFDM with 16-QAM in AWGN and Rayleigh Channels. @Lealem : I have not yet written any posts on Trellis coded modulation. I hope to do so in future (maybe within couple of months). Thank you! for ur help . But now i have got a problem when i wrote a matlab code to simulate the BER performance of a trellis coded OFDM ( OFDM with trellis coded Modulation) and i can’t get a proper result . Please try to help me by sending a Matlab code to simulate OFDM with TCM. 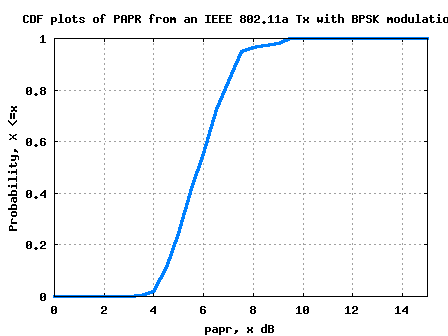 As you can see, there is no difference in Eb/No vs BER plot provided for ‘BPSK in AWGN’ and ‘BPSK over OFDM in AWGN’. As I have stated prior, in AWGN there is no performance improvement/loss by doing OFDM modulation. However, in multipath channel, when using a properly designed OFDM, the equalization becomes simpler. the random binary data is converted to +1′s and -1′s respectively for binary 1 and binary 0. Agree? OR where you looking for something else? so please i want your help in solving this problem , because i try to put this data but failed to run . Hello! Kirishna ur matlab script is very help full to simulate an OFDM over AWGN channel using BPSK and also other modulation scheme.Can u forward me a matlab script that can be used to simulate performance of BPSK modulated OFDM with a combination of TCM(Trellis coded Modulation)over a fading channel. @vyga: for debugging the code, please consider a zero noise case and see if you can correctly recover all the bits.